DC Carpet Cleaning knows that whether your awnings were installed as advertising aids, for shade or just to attract attention, you still want them to look good. The first impression your awnings make is very important. DC Carpet Cleaning experts know that fabrics react to different chemicals in different ways. We, the awning cleaning specialists, will choose the most suitable cleaning agents in order to provide you, the consumer, with the best service. The cleaning process varies according to the type of fabric or material. Some awnings require special cleaning attention to avoid damage, Others use our regular cleaning solutions. DC Carpet Cleaning uses only manufacturer guaranteed cleaning agents especially formulated for awnings and canopies in order to safeguard warranties on your product. Our gentle, manual cleaning process is the only truly recommended method. 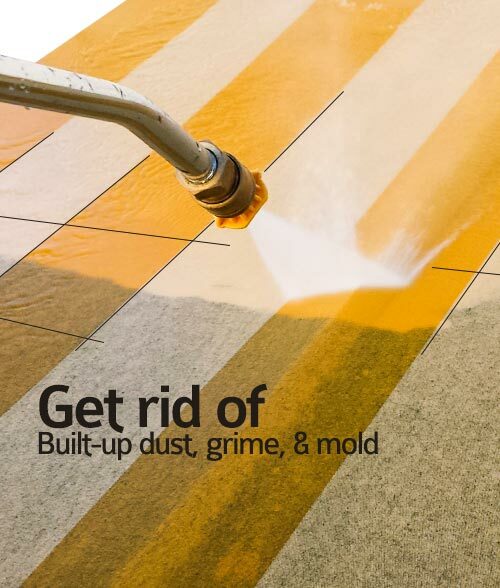 Remove deeply embedded soil, grime, contaminants! Restore the original colors to your awning! Maintain a positive image for your business! Remember - A regular maintenance and cleaning program is far more effective and much more economical than cleaning at random. If dirt, bird droppings, mildew and other contaminants are allowed to remain on the surface of an awning for an extended period of time, their chemicals will eventually cause the awning fabric to degrade. Professional cleaning will remove these elements safely from your awnings, if applied in time. However, cleaning is not sufficient. Your awnings have to be resealed after cleaning. Sealing the fabric is no less important than cleaning it. Cleaning with the most suited cleaning agents will still result in removing the protective seal on the awning. If this is not remedied, there will be fading, staining and inevitably damage to the fabric. DC Carpet Cleaning uses the best sealants to protect your awning from this damage. In economical, cost-effective terms: "It is less expensive to maintain than it is to repair..." and this holds true for awnings as well. An awning that is cleaned regularly is easier and faster to clean than one that is cleaned infrequently. Above all - Replacing an expensive awning is much more expensive than maintaining it properly.